George Washington panel, central hall, Manship House Museum. In 1857, Charles Henry Manship built his Gothic Revival style home on the outskirts of Jackson. The house is based on a design for a “Cottage Villa in the Rural Gothic Style” in A. J. Downing’s Architecture of Country Houses, a popular pattern book published in 1850. Manship used his house as a showplace for his skills as a craftsman. Cypress doors were painted to look like exotic mahogany, native pine mantels were marbled to resemble stone, and the dining room was grained from floor to ceiling to imitate a paneled oak room. During the ca. 1980 restoration of the Manship House, period reproduction wallpaper borders, similar to the original borders, were installed in panels in the central hall. According to family recollections, the central hall also contained wallpaper panels depicting statues of George Washington and perhaps Benjamin Franklin. These panels were likely from a series of French wallpaper panels made for the American market entitled “Les Grands Hommes” printed by the Jules DeFosse firm in 1856. The series depicted sculptural figures of George Washington, Benjamin Franklin, Thomas Jefferson, and Lafayette. 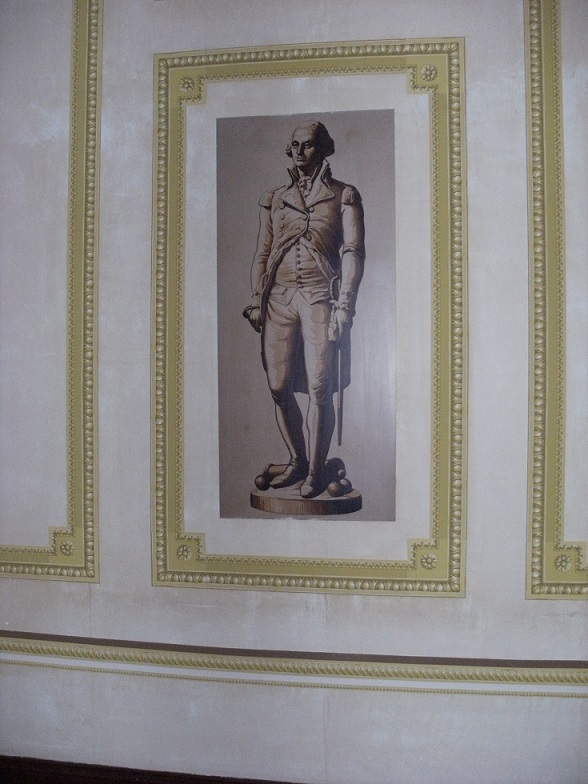 The reproduction Washington and Lafayette panels were installed during the ca. 1980 restoration.